Our team conducted a live survey and multitude of visits in different manufacturing industry to study their dispatch planning, vehicle movements and delivery to the different corners of the country. What has been observed is manual records of data and planning of logistics results huge gap between production and dispatch of goods. Communication plays a big role when large number of consignments have to move from production plant to different warehouses and finally distribution to the outlets. Majorly manufacturers rely on third party logistics vendors for different locations delivery and here is first challenge arise for manufacturers to select the compatible vendors who are able to cater the expected locations, since there is no networking between the logistics vendors, manufacturers urge to select multiple vendors segregate delivery region wise and it’s unfortunate that in India still manufacturers are seeking for a solution to hold onto this part for streamlining the sales and delivery fulfillment ratio at the accurate time. For such diversified logistics network do manufacturers have any such platform where they can manage all the vendors, analyze their performance and transparent communication? Once shippers or manufacturers are ready with dispatch planning they are required to connect their respective logistics vendors to bring those consignments at the warehouse for secondary delivery to the selling points. Multiple logistics vendors take part in this and there is no monitoring system to strict the rule of faster vehicle assigning and vehicle inspection which results delay in dispatch and reduce the shelf life of product value and increase the cost of the same product. Many countries like United States, United Kingdom have implemented RFID tags and block-chain technologies just to sort the movement of vehicles inside the production plant starting from vehicle weighing and docking of vehicles for loading. Huge queue of vehicles outside every factories waiting for their turn of loading, drivers life is degrading, poor inspection of vehicles and documentation. Why manufacturers still don’t have an appropriate system of communicating logistics vendors and assigning their vehicles and releasing them at the accurate time? Pain area for manufacturers when they don’t know what is the capacity of a vehicle and how much what number of vehicles they would exactly require for loading. No sorting of goods placement inside the vehicle results minimum utilization of fleets. Once vehicle is out of the plant manufacturers seem to be blind on that because of no trace of that vehicle. Logistics vendors update about unreasonable detention and DEPS and it continues mess with the invoice submission and accounting. 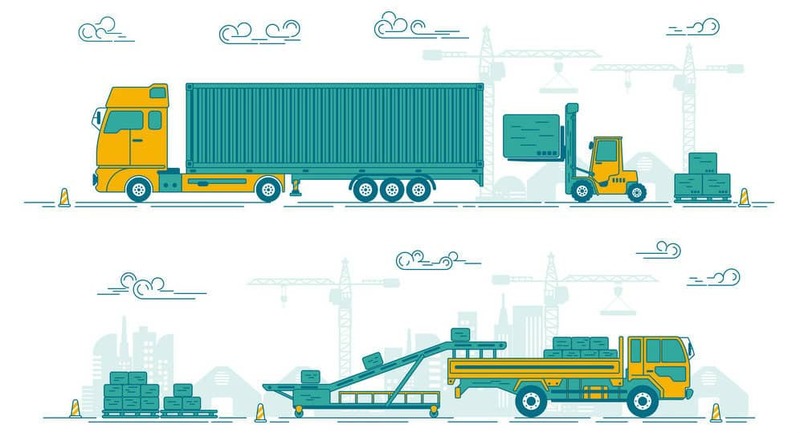 Why manufacturers can not have a system which can compute the loading, optimize vehicle wise and produce daily report of vehicle utilization to improve process flow, a system which can tell them the current time and location of vehicles and automatically update the delivery to minimize the detention and streamline invoice accounting? It needs to create a process flow to study the current sales and forecasting sales, production counts and prepare a daily dispatch plan according to that. A network of connective logistics vendors and intimate the requirement to them with an interval prior to dispatch day. A smooth bridge to run all the vehicles to provide the loads through an appropriate funnel and finally a system to do all these activities automatically which weights the vehicle, inspect, approve for loading and keep the entire process healthy till vehicle arriving at the destination. A smart system which can guide the driver throughout their trips. Technology which simultaneously communicate with the shippers and logistics vendors about the vehicle reach and suggest the same for next trip. Eventually system gets to know the complete expense of that trip and help in invoice validation and process accordingly to avoid conflicts between shippers and logistics vendors. LogixGRID presents Logix Network, India’s First AI Driven Platform to Manage Primary and Secondary Logistics For Manufacturers. Logix Network offers complete vehicle allocation vendor wise and Artificial Intelligence compute the area required to deliver the number of products, where shippers exactly get to know how many vehicles required for specific set of products or sales order or invoices with a complete visual tracking system to calculate the time of arrival and minimize detention. Logix Network Artificial Intelligence verify the invoice amount and identify the variance and even auto communicate to the account team where invoice validation and approval become facile and trouble-free. A system which is demanded by major manufacturing leaders in India on the day of its release. This system is more of concepts driven by Artificial intelligence and block-chain technology for data management. This system corporate with the major telecom leaders, pre-integrated with the GPS device providers and other ways of providing tracking system. Its Artificial Technology is in rapid phase of improving to suggest business prospects and interactive to the users.